The Mentos Geyser made history once again as the star attraction at the NAEYC 2006 Conference in Atlanta, Georgia. Over the rumble of the crowd in the exhibit hall, you could hear someone from the Spangler Science booth yell, “GEYSER!” followed by a few screams and cheers of excitement. The “geyser” was actually the eruption of a two-liter bottle of Diet Coke powered by Mentos. As soon as people approached the booth and saw the mountain of soda and the display of Mentos, they knew what could happen… but most people didn’t believe that we would actually launch the geysers from behind the booth. Surprise! Instead of just launching the Diet Coke just for fun sake, we used each opportunity to deliver a quick science lesson and followed it up by putting one of our Geyser Tube Experiments in each of the teacher’s hands. 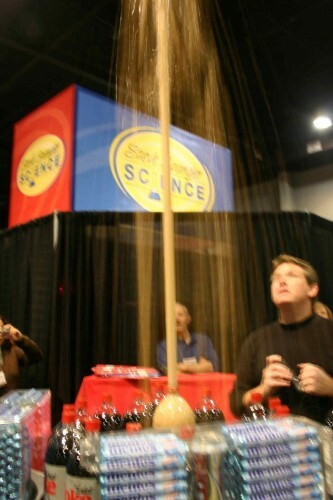 Out of the 11,000 people reported to be in attendance at the event, we personally handed out 7,000 Geyser Tube Experiments (which included a roll of Mentos). We even had a few guest “geyserists” take center stage in the booth and try their hand at a launch. Thanks to our partnership with Perfetti Van Melle, the people who make Mentos candy, each teacher who visited the exhibit received a free Mentos Geyser Tube experiment which included a roll of Mentos, the launching tube and instructions to explain the science behind all of the fun. Pete Healy, Vice President of Marketing for Perfetti Van Melle, commented on the interactive aspect of the geyser experiment. “We’re excited that Steve Spangler Science is using the Mentos Geyser experiment to demonstrate that learning can be fun. Teachers know that interactive learning is powerful””and Steve Spangler Science has been a leader in this area for years.”? Atlanta-based Coca-Cola supplied 700 two-liter bottles of Diet Coke for the geysers that launched every two minutes over the course of the entire show. That’s right, we launched 700 bottles of Diet Coke… one at a time. Coke.com is running a contest through the end of the year called Poetry in Motion, celebrating the fun and beauty of everyday things used in unexpected ways – just like the popular Mentos and Diet Coke demonstrations on the internet. Teachers are encouraged to post their creative class projects on coke.com. Mentos and Soda Mix – An Erupting Business The Mentos Question on Who Wants to be a Millionaire?